Previously was 'The Gold Man', and now, 'The Silver Man'. Well, my buddies and I saw 'The Silver Man' among the crowd at the same location as the appearance of 'The Gold Man'. If you wanna see 'The Gold Man', please click HERE. 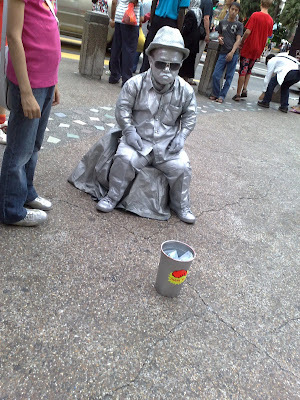 Here's a picture of 'The Silver Man'. Hope to see 'The Bronze Man' in the future! Click on the image to have a larger view.